Quiltmaker 100 Blocks, Vol. 6 Blog Tour! 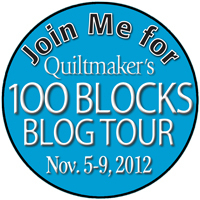 November crept right up on me and here it is November 5 and time for my Quiltmaker 100 Blocks Blog Tour post! I’m so excited to be included in another fantastic issue of 100 Blocks! Leave a comment by Nov. 11 and be entered to win a free copy of this issue. How fun and easy is that?! I have a new friend to introduce to you today called Scarecrow Surprise! This guy came about because I wanted something that said “autumn,” but was also playful and included a tiny bit of hand embroidery. You can find Scarecrow Surprise on page 30 of 100 Blocks Vol. 6. And look there to the right…I’m super excited to have Scarecrow Surprise right next to a wonderful pattern by Charise from Charise Creates! How awesome is that? Here’s something else fun… Scarecrow Surprise is on the cover, too! He joins May Showers as 100 Blocks cover alumni! What? You’re supposed to be scared of me! I started with just a scarecrow, but after a couple of doodles, I quickly realized that he was a lonely old guy standing there all alone. I started thinking about what a scarecrow is actually supposed to do and I wondered how often a birds ignore the You Shall Not Land directive. When I drafted this guy out, he had a plain face. After adding the bird to his shoulder, I realized what was missing…his reaction! Here it is penciled in on my first draft. Here’s a little sneak peak of how the pre-published version of the pattern looked. Look, ma, no numbers! And, of course, I have to share some variations! Above is Stonehenge Scarecrow, Feeling Blue Scarecrow and Warm Colors Scarecrow! Quiltmaker’s 100 Blocks, Vol. 6 will be available at your local quilt shops and bookstores November 13 and I will be selling a limited amount of signed copies in my etsy shop, so be sure to check back for that! Come see me at Honey Bee Quilt Store in Austin, Texas, Sunday November 25 for a Quiltmaker’s 10o Blocks Vol. 6 magazine signing event! I will be signing magazines and sharing some of my other work! Featured Pattern Set: Holly Jolly, just $6 on Craftsy! This entry was posted in Events, Holidays, paper piecing, Published Work, Quiltmaker Blog Tour and tagged 100 blocks, jennifer ofenstein, published, quiltmaker, scarecrow on November 5, 2012 by Jennifer Ofenstein. Oh I am so excited about this one… Wonderful block. Congrats on your block being published (and on the cover as well)!! That’s great that your block was included! It is so cute. I’m looking forward to getting this magazine. Congratulations ! It looks like a beautiful book. Not only as a resource or project book but even a “just for fun” book to read and “wish”. You are very talented and creative; you deserve to be included and featured. Congrats! What a sweet block this is! Dare I say it? One of your best! What inspiration this scarecrow brings! I would love to win Quiltmaker100 Blocks! I can hardly wait to see more inspiration in it! What a Treat!!!! This is wonderful. He is great w/o the embroidery, but he is wonderful with it. It really does give him personality, Congrats on cover x 2. I would love to win – thanks for the chance. Great block! Nice that it was on the front cover. 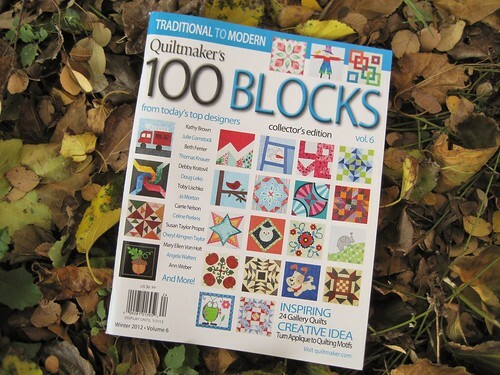 I am looking forward to getting the newest Quiltmaker 100 blocks magazine. Oh this block is so cute! Love it! Love your block — especially the bird! I knew that scarecrow was yours when I first saw the cover! Congrats on the 100 cover. He is just wonderful! Of course he is on the cover. Congratulations! A funny block. I like it. Beautiful block.congratulations on being in!! Cute scarecrow! Brave little bird! LOL I love it! Hi!!! He is sew cute!!! Great to see him on the cover!!! Thanks for the fun!!! Your scarecrow is sew cute! Wish I could have seen the stonehenge version. Wouldn’t he be cute as a ‘monthly’ guy, all done up in ‘theme’ clothes? Thanks for the chance. I’m new to paper piecing, but I think your block is so fun! congrats! Congratulations on being included in the magazine! Your block makes me smile. I’m going to make one when I get this magazine! So cute! I think I need to learn to paper piece just so I can make it. Love seeing your variations as well. Thanks for sharing! Love foundation piecing and your scarecrow is so cute, he certainly deserves a spot in the book. What a cute block. Will definately be doing a lot more paper piecing after visiting around here! He’s so cute, I can see him in a garden quilt. Thanks. Your block is very cute. Thanks for the chance to win a copy of the 100 blocks issue #6. Oh my goodness! This is way too cute and precious! Thank you! Cute block! Congrats on making the cover. Thanks for the chance to win. Another block to inspire my inner farmgirl, thanks! I love your scarecrow and your site. How have I not come here before? Thanks for the chance to win! I can see this as a Fall table runner. Congrats on making it in to this issue! I have so many adorable mini fall prints that would be perfect for his shirt!! Perhaps a Bell Pull using 3 or 5 – Congrats! What a cute scarecrow, love the face. Congrats on making the cover! What a cute block. Wouldn’t this be super cute in a Thanksgiving Table Runner? I love the facial expression you gave him. Congratulations on being in this next issue and on the cover too. Yay. Really cute! I’d love to use this in a quilt. Love that scarecrow! There are never enough blocks. scarecrow is adorable. I love paperpiecing!! Love the scarecrow and perfect for the season! One can never have too many scarecrows…not in my opinion! Love VickiT’s idea of making a T-day Table Runner! 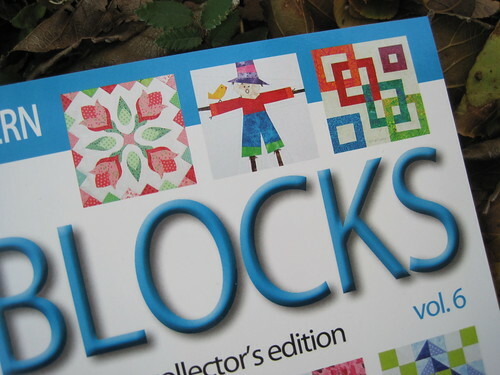 Would also love to be the lucky winner of the new 100 Quilt Blocks Vol 6! Your work is always gorgeous. Grats on being in the magazine. That was my favorite block on the cover! Nice to know who designed it. Great Job!! How fun! And, yes, a birdie is just what is needed. Very cute block and the addition of the bird is great! Thanks for the chance to win the magazine. What a cute block! I’m not sure what I’ll use him for, but I think I need to make him for something! Thanks for the chance to win. Such a handsome scarecrow! He’ll be perfect for a friend who loves to decorate for all the holidays. Thanks for a great pattern idea! Your block looks wonderful. I hope I can catch a copy of 100 blocks. Unfortunetaly its not available here in austria. So cute! Thank you for the opportunity to win! What a cute block! I recently tried paper piecing, and I am thrilled to say it is my new go to technique! I love your block. He is so adorable. adorable! would love to win a copy of the mag! Oh, I love your block! And congratulations on the cover shot…you are a true cover girl with two of them! Congratulations on being a cover girl! Love your block! Love paper piecing. Congrats on the cover no less. Love to win. I love your block. He is adorable. Congratulations on making the cover. What an honor. Congrats. on being on the front of the book! This is a cute scarcrow block but I have to admit that I’m not good at paper piecing. You do a wonderful job with it! congrats! love the scarecrow, and the book looks awesome! Gorgeous scarecrow. Thanks for sharing. The mag looks wonderful. I can just imagine a whole row of these little guys! Terrific take on scarecrow and friend. Great block! I see this on a mug rug. I could be ready to decorate for next fall. What a cute scarecrow. That is so darn cute and a very clever block indeed. AND, it made the front cover. Good for you. The mug rug is a very good idea, too. Thank you for the wonderful chance to win a copy of this precious magazine and for joining in on the Quiltmaker’s 100 Blocks Blog Tour. Wow, that is one cute scarecrow – congratulations on being published again! I love following your blog. I do not comment often but I do look forward to reading them. I am very excited about you being in the new mag. I hope to win a copy! So cute–he just needs a female companion–don’t you think? cute scarecrow love him done in Stonehenge colors..
Congratulations on being selected! Mr. Scarecrow is such a cutie! Can’t wait to get my hands on 100 Blocks Volume 6!! So many great patterns to drool over!! congrats on your block being published. he is just too adorable. thanks for sharing. I love this block and congratulations on being included in the magazine again. I hope I can win a copy of this. Thank you for the chance to win. I like all things autumn and your scarecrow is definately adorable. Your scarecrow is so cute – and I know that crows will still come by them! LOL! Adorable! Sorry scarecrow, you’re not scary. Fantastic! I’m a real newbie to machine paper piecing, I’m awed by the lovely blocks you have posted on your blog. What a very cute scarecrow! I would love to win a copy of the magazine. Yea Jennifer! I’m so excited for you and I love the block! Your block is so cute, it made me giggle! Congrats and thanks for the chance to win. 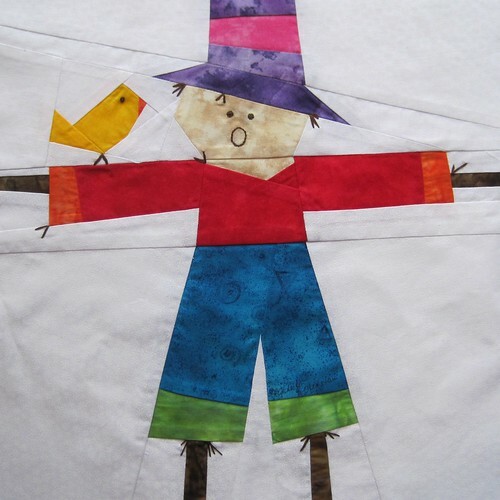 That is a really fun block and it would be a great way to use up scraps and make a quilt with lots of scarecrows in different colors and prints. How cute is that!!! Thanks for sharing a copy of the latest 100 Blocks magazine! I know that you were thrilled to be asked to put a block in this magazine. Way to go. Love the scarecrow. Great block! Congrats on being in the magazine! Your sweet block made me grin. Congrats! Cute block. Congrats on making the magazine. Your block is cute as can be. I can imagine it as a seasonal wall-hanging. Love your little scarecrow block. Thanks for sharing. Always a fan of your paper piecing patterns! I can’t wait to get ahold of Book 6. Congrats. I love paper piecing and just finished teaching a class for our Guild on PP. YOur design is really neat. Wow…such an adorable block! Now I can’t wait to ge my copy of QM’s latest 100 blocks magazine! Love your scarecrow! Congrats on the cover. I want one of these books. As always, you have great blocks. I love them. Congratulations. He looks more scared than the bird! Too cute! I love that sweet little scarecrow face! Darling block. Congratulations! your scarecrow is too adorable…. he probably has lots of birdie friends to keep him company. Would love to win the magazine. LOVE your scarecrow block, you just don’t see many quilt blocks of the little guy. personally, I’m not too fond of paper piecing but may have to try this one. enjoyed visiting your site. Your scarecrow is soooo cute! 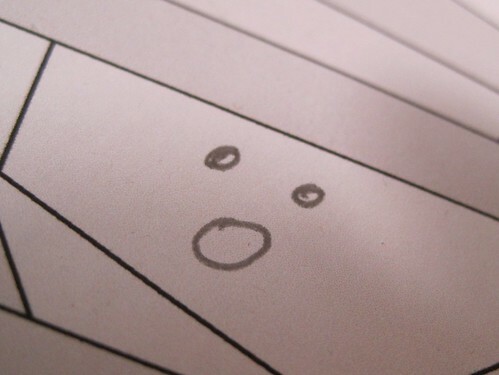 I love the surprised look on his face! “Scarecrow Surprise” is a great block! I love it! Congratulations on being chosen again & having him on the cover! How sweet it is! Your scarecrow is so cute. Congratulations for making the cover of the book. Too cute! Perfect for an autumn quilt. Congrats on the inclusion, it’s a cute block! 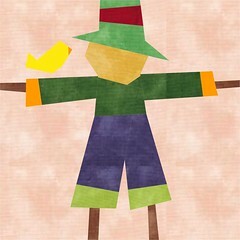 Love your adorable scarecrow block! Congrats on being a part of the publication! Your scarecrow block is very cute! Congratulations for being so prominently shown on the cover. The scarecrow’s facial expression really makes me smile! Great job, it looks simple enough even for me to make. Love that block! It’s not going to scare too many crows, but who cares? Congratulations for hitting the cover! Your block is so sweet!! I love it!! Your block is darling. Love it. I also scrolled down and saw other blocks you do. Liked them all. Congratulations on being included in the new publication. Hello Jennifer. Your scarecrow is so cute! I like the added embroidery “straw” coming out of him. Cute, cute, cute! Just stopping by to say “hello”. Don’t include me in the drawing, I’m on the tour, too. Love your block! He is so cute. Thanks for the chance to win. I love it Jen!!! Very cute!!! So adorable! I love paper-piecing! He would have to go into my Halloween/Fall paper-pieced project. And looking back at your posts, that little Holly Jolly quilt is adorable, too! Thanks for such fun and congrats for two cover blocks! Love paper piecing and love your block – congratulations! Jennifer, What an honor for you to be on the cover of Quiltmakers 100 Blocks! The scarecrow is an adorable design. Congratulations! Congratulations for being in the book & on the cover. Great block. What a fun block for a fall wallhanging! I really like your blocks. I just learned paper piecing and lot it so can’t wait to try yours. Adorable scarecrow. And on the cover too. Congratulations! Your block is very cute and would be a nice wallhanging or table topper for the fall. Congrats on your block and thanks for a chance to win a copy of the magazine. Your block is adorable! Love all the others too. They would make a great sampler quilt. Congrats on being in the magazine. I am intrigued by the piecing of the scarecrow quilt block. Very different and inspiring. Congrats – I want to add this pattern to my turkey for a Thanksgiving wall hanging. Thank you for sharing yourself and patterns. What an adorable little scarecrow man! Can’t wait to see the magazine. Thank you for offering the opportunity! Love the scary scarecrow and thanks for a chance to win the book. will it be autographed as I would just love that. Adding the bird really made the scarecrow block sing (pun intended). Very fun block. I make seasonal wall/door hangings for my parent’s door in a retirement community. This would be so fun for that! Blessings! A wonderful seasonal block that looks really fun to make. Thanks for sharing. This is fantastic!!! It’s so playful and yet intricate. Paper piecing really speaks to my heart so this is definitely one I want to work with as soon as the magazine hits our stores. I love this square! It is so fun to have something fall! What a fun block! That facial expression is priceless. That block is adorable. I don’t do paper piecing really well and I am in awe of those that do. Thanks for allowing me to enter the contest to win the magazine. What a great block. I am in awe of those who can paper piece well and have such an artistic way of doing so. Congrats on that block and thanks for letting me enter the contest. Looks like a fun block! I’ve only done a little bit of paper-piecing, but think I can manage this block. Great block. I have been looking for a cute scarecrow idea and there it is. ANd I love to paperpiece. I have to admit….your block was the first one I drooled over on the cover 🙂 SO cute! congrats on being included in the 100 again! Love the colors you chose for the scarecrow. I really enjoy hand embroidery so this block would be fun to make. I am so proud of you! You have delightful perseverance, and it’s paying off. You rock. You have such great detail on your block and its so cute! Congrats on making the cover of the magazine! Love the scarecrow. The hand embroidery adds just the right touch to complete him. Thanks for the chance to win. I have enjoyed your site for a while now. Congratulations on making the 100 block cover with your not so scary scarecrow!! I love the expression on your scarecrow. It is great to see a fun fall fellow. And I know just where I want him to live. Delightful! I love your scarecrow block! Congratulations! What a great block. I just finished making your Christmas Sunbonnet Sue for a gift. Cute and easy too. Scarecrow Surprise is so cute no matter what colors are used to put him together! Such a fun block! I’d like to test it, and hope I win a copy of the magazine. Thanks for the chance. I’ve never paper pieced before, it scares me, but this scarecrow is fantastic! Love your Scarecrow Surprise!!!! Thanks so much for sharing him with us! Congratulations! What a cute scarecrow! Thanks for the giveaway! Your scarecrow is SO ADORABLE and FABULOUS….I don’t know which adjective I believe most!!! I MUST make him. I’m a total Wizard of Oz junkie…could you make me patterns for Dorothy and the Witch, Tinman and Lion too??? Please?? And maybe a house and a green castle. OH just design an entire paper pieced Oz quilt ok??? I’d be your #1 fan and purchase them all! Such a cute scarecrow! I enjoyed seeing your design process. I love Paper Piecing and your Scarecrow is on my list of To Do for Thanksgiving Table Runner. So cute! Great block..can see doing it in several colours. Thanks for the chance to win. Cute block! Can wait to get my hands on this latest issue. I have a granddaughter who loves scarecrows — what a wonderful block this is going to be for her — probably as a pillow. Congratulations on being on the cover! He’s too cute to be scary, hehe! Your block is super cute! Congratulations on being a covergirl! I had not heard of your blog before. You have some wonderful patterns here! Congratulations on being published and on the cover! Love your Scarecrow! what a cute fellow, and congrats on the cover. Your scarecrow block is adorable! Congrats on havin your block on the cover too! What a cute little guy he is. All your patterns look wonderful. Love the Scarecrow! This is my first time here and I love all the patterns you have here. Love the added touches of his face and the embroidery stitches all over the place. They make this block! Thanks for sharing. He’s so cute. And congrats on being a cover girl. Your scarecrow just grabs attention on the cover. He is a cutie. I’m not good at foundation piecing but I always want to try it when I see blocks like this. this guy is just too darned cute! I love the expression on his face! Very cute block. A very cute block. I like paper piecing. Cute block! I especially like the bird. How cute this scarecrow is (bet even the crows love him). Love your other patterns also. Looking forward to having this great book. Thanks for sharing your process. Makes it very interesting to see how you arrived at the finished product. Cute scarecrow!! Your scarecrow is adorable. This would be so fun to make! Very cute block, looks fun! Such a great magazine! Would love to win! Congratulations! He is adorable, especially the look on his face! Congratulations Jennifer! I will be keeping my eyes open for the next issue. It took me over a month to find it the last time. Your little guy is so cute. I Love the staw peeking out all over him. Congratulations! Your scarecrow is a cutie. A lovely looking block, it may me awhile to get the nerve up to try it as I just started quilting this summer. What a cute scarecrow. I’m a gardener and this is a block that I will definately make! Thanks! Mr. Scarecrow deserves his front page status! So cute, not scary at all. Wish Texas wasn’t so far away as your signing party sounds like fun. Cute scarecrow! Love your pp’ing blocks! Thanks for the fun! Such a cute block! Congratulations Jennifer. You could do a whole quilt with each scarecrow having a different reaction amd different birds and different seasons…possibilities abound. I am going to have to do some paper piecing. Your block is so cute! Congrats on having your block on the cover, very exciting! Your block is absolutely adorable and I can’t wait to sew one…perfect to hang on my front door in the fall! Cute block! I think I’d buy the magazine just to get that pattern! Congrats on having your block included in this issue. I love, love, love this publication and snap it up whenever it’s released. Your scarecrow is TOO cute! Very cute, and like seeing some of your design process, very interesting. Thanks for the chance! This blog is the first 100 block blog, I have participated in. It is fantastic seeing all of the participating sites that are taking part in this blog tour. I love seeing all of the new blocks you have created they are awesome. 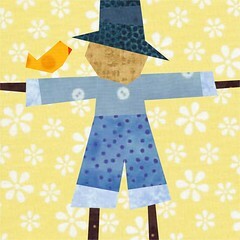 The scarecrow block is really cute! Oh, your scarecrow is really cute! I love the block, most likely would do it in applique because I struggle with paper piecing. I would do the warm color version. Congrats on being published. This would be super fun to make! Very Cool!! Que medo!!!?? ?Quando criança tinha muito medo de espantalhos,…na casa de minha avó tinha alguns espalhados por jardins e hortas.O seu não assusta ninguém é simpático e lindo,parabéns.Obrigada por dividir comigo esta técnica tão divertida. What a cute scarecrow! I’m sure there are many blocks that I will want to make in this book. Scarecrow guy is so cute! I love thinking about all the scrappy variations that are possible! Congrats on your block and thanks for the chance to win! Cute block! Would make a cute border around a quilt too. Thanks! Love your scarecrow! I’m just learning to paper piece, so I haven’t gotten this advanced yet. But you give me inspiration to keep practicing!! WOOOHOOO you created a cover guy!!! He is sew cute!!!!! I love his perplexed expression towards the bird! How cool is it to be a published pattern designer?? Sweet!!!! Thank you for sharing and for the opportunity to win this awesome book! So whimsical and not scary at all. Very cute! Your block is perfect for autumn and so cute, too. Thanks for the giveaway! OMG this little guy is adorable!! This is so darn cute. 🙂 I haven’t done much paper piecing, but this block will be one to try!! Thanks for sharing and congrats on being published in the magazine!! Too too cute!! THANKS for the chance to win a copy of this issue. What a great block. Surprise Scarecrow is so cute. Love the bird. I can’t wait to add this to a Fall wall hanging. I love this guy! too cute. Thanks for your giveaway and for sharing. What a handsome scarecrow! I’m a beginner when it comes to paper piecing but I will have to give this guy a try. The scarecrow is to cute for words. Congrats. Love making blocks like yours……thanks for your great ideas. I knew it!!! I saw that cute little scarecrow on the cover and had a feeling that was yours! Congrats on the block as well as getting on the cover!!! Can’t wait..gotta have this magazine..with an autograph..ofcourse!!! Just learning paper (foundation) piecing on Christmas ornaments. This block looks like a great next project. Thanks for the opportunity to win a book. I really like how you make picture blocks. Your followers have always known that you were a cover-girl. I love your scarecrow. I would love to win your extra copy of the magazine. He is so cute. I may have to find a little quilt to use the pattern in. Thanks for a chance to win. Congratulations on having your block on the cover. What a cute scarecrow I love that you added the bird on it. Your scarecrow block is just adorable! Thanks for entering me into your drawing! 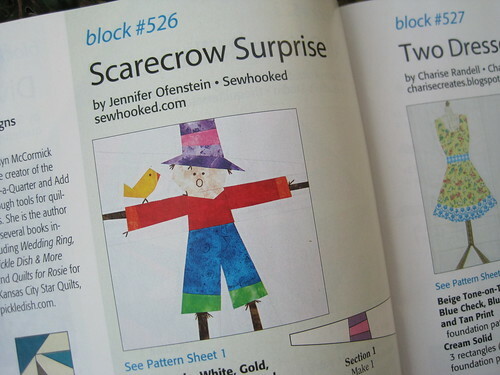 I love paper piecing and would love to try your scarecrow block,congrats on making the book and cover. What a great block for a fall quilt. I would love to have a sign copy; This would be my first 100 block book as I am new to quilting and I am slowly building a collection of books. Your scarecrow is so cute! This is very cute! You are so talented. What a fabulous block. I love the little tufts of hair peeking out from under his hat. Well done and congratulations! Wonderful and so charming ! I am sew excited! Can’t wait, all the blocks are too cute! Congratulations on having your block on the front cover. That’s awesome! OOOOOO, this volume looks wonderful! I can’t wait to get a hold of it!! That scarecrow is so funny and cute – I love the bird on his shoulder. Wow! That’s the most detailed paper-pieced design I’ve ever seen! So cute, too. Wow Jennifer! I hope you have more than 1 copy!!! LOL! It is a fabulous pattern and you sooooo deserve to be in the magazine! love that scarecrow! 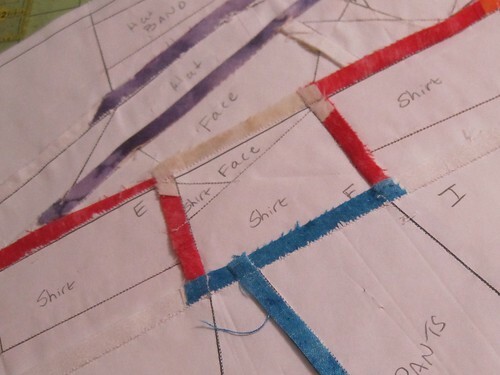 Paper piecing can do so much! and it’s a great pattern for a scrap lover, like me, gets me thinking of a quilt for that scarecrow. maybe a scrappy house for him to live in on it……..
Love the scarecrow! He is so cute! Mahalo for sharing different stages as you create! Love your scarecrow – a welcome newbie! very nice block! I like their designs. he is full of personality. I love it. This is such a cute block and nice for Halloween or Fall. Congratulations. Your scarecrow block is cute – great for fall. Congrats on not only having the block published, but a covergirl as well! whoo hoo! Love this little scarecrow, especially his little wisps of straw peeking through here and there! Congrats! 2 years running! Major congratulations! Cant’ wait to get a copy of this magazine!! Your block is really cute!!!!!!!!!!! Your scarecrow block is neat! Congratulations, You’re design is wonderful! I love pieces like this they definitely tell a story! Congratulations on being part of the magazine. I love this magazine because it has so many ideas.